Are you thinking about what others see in you? Are you afraid of going beyond the norm and live differently? Then you are not master of your own Kingdom. It takes great courage and determination to stand up for yourself and others. We are surrounded by norms of fashion and lifestyle that does not speak to your own heart. You simply don’t think you are enough in the first place. It’s the greatest freedom of all, to be who you really are. This drive made me start HUFVUD and make hats where others say, it will never work. “People don’t wear hats!” they say. But they do, lots of them. The bravest and the ones that own the game of life, instead of being just a player, are the ones that have told the world who they are. You want to wear a hat, but you do not know which style would fit you or you have heard nothing works on you. It’s never about what other think and want to see in you. Sometimes you have to shut out the noise and drop the baggage. To loose friends are not a comfortable experience. But if they can’t see you for who you are, then they are not your friends in the first place. Joining a community that think the same and love to do what you do, wear what you love, is a way to find new friends that respects you for who you are. This is a great lesson i learned listening to an interview with Guy Ritchie. There is a world out there that tell you who you are and there is a world inside that try to tell you who you are. Where do you want to put your X? Take possession of your life. Own the game of life, accept the rules and move into those rules. I love to help you to be yourself. It doesn’t have to be about a fashion statement or to express something. Just be comfortable and walk tall, wherever you are. I hope this inspired you as much as it did for me. Now let’s talk about hats. I had a great productive week in the studio, as always. Helps when you love what you are doing. I celebrated my birthday on April 4th with friends and family. I still worked on that day. Figured its better to celebrate during the weekend. The hats won’t be made by themselves. As I mentioned last week, more HJALMAR BOWLERS on the way. 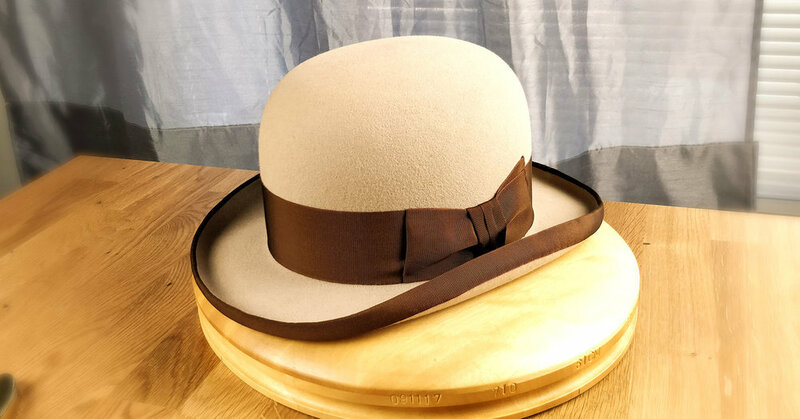 This week I finished up and shipped a Sand colored felt Bowler with brown color ribbon and brim binding. Amazing hats to work on and I love to make them. This week I am making another one in EMERALD GRAY with brown ribbon as well. This week is a 30X Beaver blend to the bowler, which I strongly recommend. As always I finish up my day, or work in the evening, by stitching a few sweatbands for next day hats for assembly. My working shift is sort of a split one. I tend to get up at 05:00 - 06:00 am and plan out the day. There after I work in the studio with blocking hats and steaming hats. Later in the day is all about stitching and a bit of marketing, as well as bookkeeping. It can end at around 10 pm. I am alone in this endeavor and switching between roles has been a great learning curve. Your support and designing hats with HUFVUD helps it to grow in designs and tools. My wish is for the craftsmanship of making hats to live on. I got another mystery project coming up, that I only work on on my breaks or after I have completed all the set tasks of the day. Otherwise there is not time at all to make them. Not about to reveal anything yet but lets say, its a Sage color fedora. Check back next week to see how it unfolds. LEIFUR Lucky FEDORA is always on the table, every single week. Always different and yet the same boxy look that I love to make. This one is shipping out on Monday once the liner is inserted. I am also working on a Royal Blue 30X Beaver Ragnar that is half way done. Didn’t manage to take a photo of it before I left the studio on Friday evening. Will have to wait for next week. It will be with a 50mm blue grosgrain ribbon, Cotton/Rayon blend. I have mentioned a bit already of whats happening next week. We got the following hats coming up on the block and out of the studio. Hope it gives you a bit of inspiration as well. That’s it for this week. Stay tuned for next week. Remember, Ladies and Gents, own the game and be the master of your Kingdom. Send me an email at any time and we will design your hat together or simply just talk about hats and life.